Castlevania's 3DS entry was originally a way to hedge bets on series success. 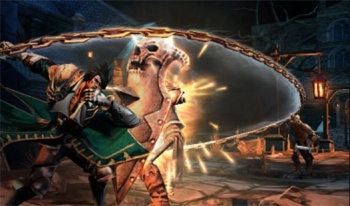 Opinions have been pretty split on the Castlevania: Lords of Shadow reboot, and that ambivalence has carried over to its next two entries: Mirror of Fate on the 3DS and Lords of Shadow 2 on consoles (well, most of them, anyway). Konami is aware of the two very different parts of the fanbase it must please in the next few Castlevania installments, and has used Mirror of Fate as something of a testing ground. This entry was originally a low-budget lark, but the developer now wants to ensure that it delivers both a vital component of the Belmont clan's story and some of the more traditional Castlevania features for which fans have clamored. "Some people liked what we did [with Lords of Shadow], and a lot of people didn't like what we did, so I think this time it's a bit easier because people kind of know what to expect," says David Cox, a producer at Konami. However, Cox wants to woo back some Castlevania fans who felt that Lord of Shadows was too lacking in traditional elements. "I think we tried, particularly with Mirror of Fate, to meet some of those detractors a little bit further and meet their demands." Exploration, says Cox, was a primary concern, since Lords of Shadow was a fairly linear game. "When we were designing Mirror of Fate, exploration was much higher up on the list of things we wanted to achieve in terms of the final product." This is a delicate balance, because Cox also wants to deliver a focus on combat that new fans have come to associate with the series. "We don't want people who bought Lords of Shadow to suddenly get something different." While Mirror of Fate will now play a large role in reintroducing traditional Castlevania tropes and bridging the story between the two console entries, it started out as a much more humble project. "We weren't sure if [Lords of Shadow] was going to be successful or not," Cox explains. "We didn't know if the game was going to be popular, so we said, 'Let's make a handheld game; you don't need much money.' We could do something small in order to carry on the series if necessary." The game did not end up as a series torchbearer until Konami gauged the reboot's success and wanted to get to work on a new title right away. Luckily for Cox and his team, Mirror of Fate was already in the works and still very malleable. Whether Mirror of Fate will scratch the Metroidvania itch of Symphony of the Night-style Castlevania fans, it's worth noting that nonlinear exploration and RPG mechanics have not always been series staples. In fact, about half the series has no such elements. That's something to chew on while waiting for Dracula to rise again.